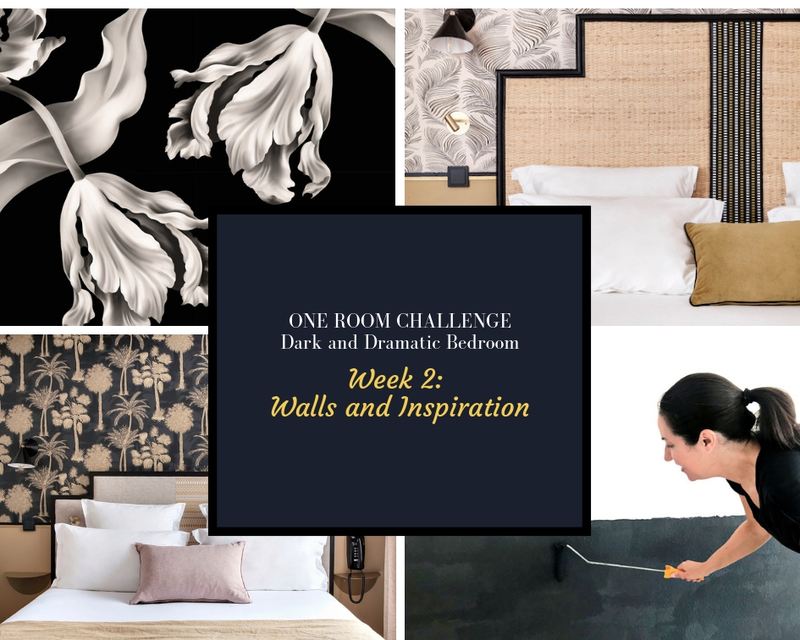 It’s already week two of the One Room Challenge and there is so much to be done, but the work has commenced. 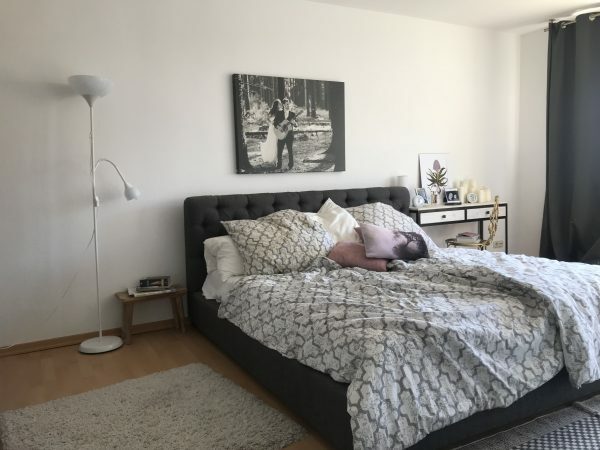 The biggest change I wanted to make with my bedroom is to take it from boring white and undone to decadently dark and moody. 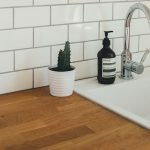 Paint and wallpaper are number one on my priority list. In case you haven’t seen the before photos, here is a look at the room as I started the project. 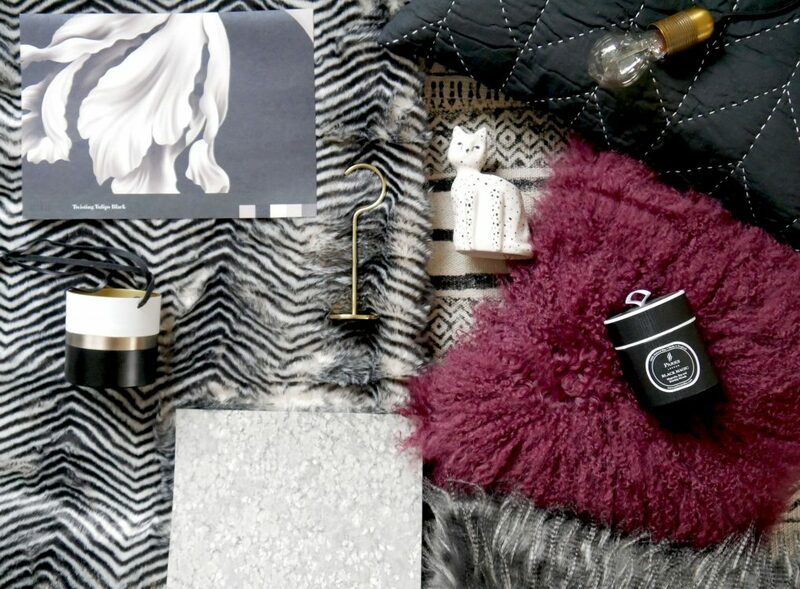 The colors of the room will stay true to the color palette of my whole home: layers and layers of neutrals. Black, white, grey, greige and creams. 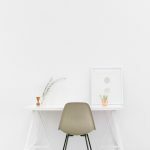 You might think I am adverse to colour of you hear that list of neutral shades, but the truth is I adore colour and that’s why I stick to a neutral base. I can add in pops of colour at any time and change easily with the seasons or my whims. But I do really love black and white, especially in patterns. 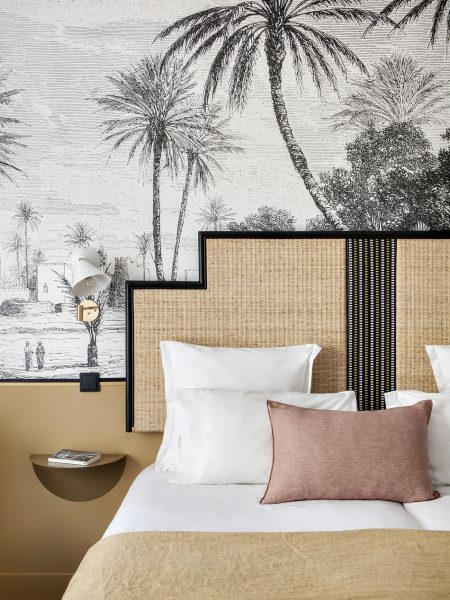 For the past few months I have been thinking about painting one wall dark (black or dark grey) and toying with the idea of a dramatic dark wallpaper, but when I saw photos of the Doisy Etoile hotel in Paris, I was filled with all kinds of new inspiration. 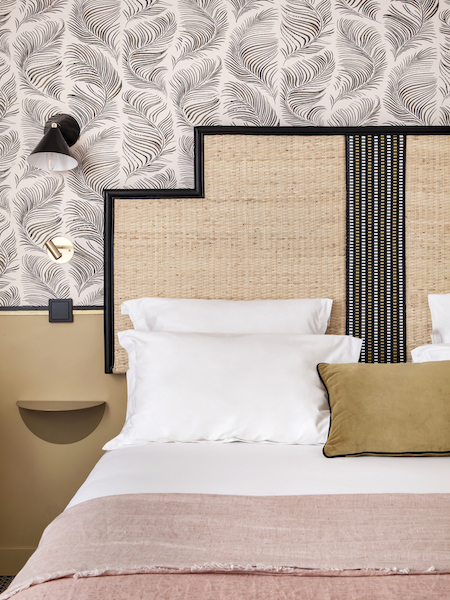 First of all, boutique hotels are a wonderful source of inspiration for bedrooms because who doesn’t feel pure indulgence and luxury in a perfectly designed, uncluttered space? 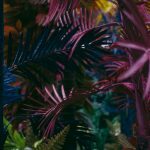 Unlike big name hotels, boutiques dare to add drama and personality to their rooms in order to make them memorable and truly unique. 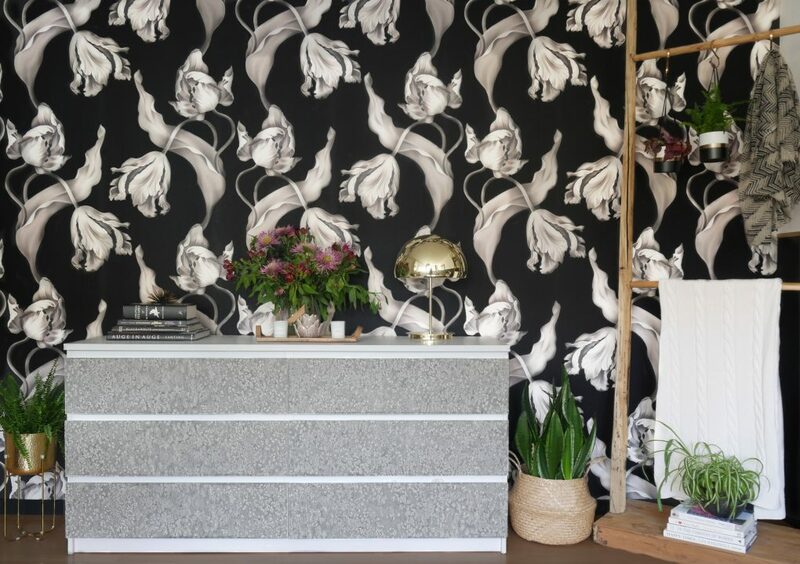 Wallcoverings are used extensively in luxury boutique hotels as they bring textural interest and depth to a space and I absolutely love the way the Doisy Etoile has combined paint and wallpaper. After seeing these images I seriously considered wallpapering the top half (or two-thirds) of the “bed wall” and painting the bottom, in the same style as the Doisy Etoile. And additionally figuring out a way to add the sleek and modern dado rail in between. 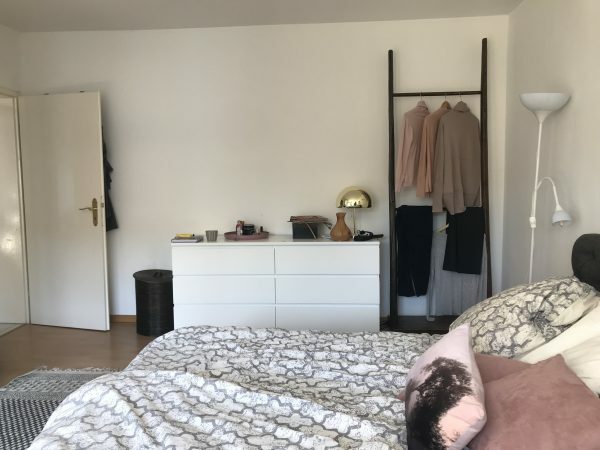 But after a long consideration, I decided that I really do want to wallpaper the adjacent wall where the plain white Ikea dresser stands. 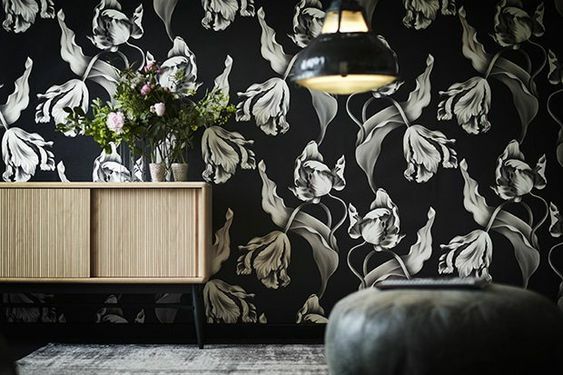 So I will do just that, wallpaper the whole wall of the “dresser wall” with a dark and dramatic floral wallpaper. I’ve decided on Ellie Cashman’s Twisting Tulips in black. 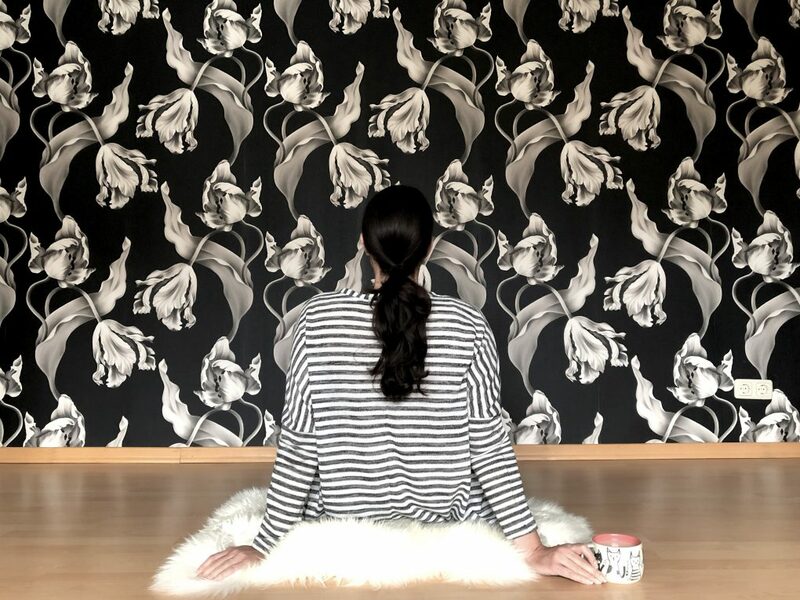 I fell madly in love with Ellie’s designs the very first time I saw her wallpaper and have been dreaming of using one of her wallcoverings in my home for years. 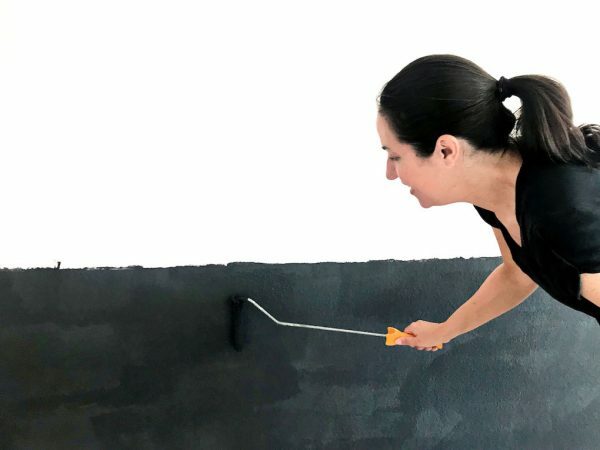 But I will also paint the bottom half of the “bed wall” black, leaving the top half white and and I’m going to do my best to create a similarly sleek dado rail to add interest. This week I started the painting and we’ll call this Round One. I love the darkest anthracite paint that I’ve put on the wall behind the bed, but I’m afraid it’s just not going to be dark enough next to the wallpaper. I’m currently waiting for the wallpaper to arrive from the Netherlands and I’ll make the decision if I repaint after I see it in person. In the meantime I am waiting for nightstands to arrive and I’m looking for the perfect chair. I’ll tell you more about the furniture next week, so stay tuned! 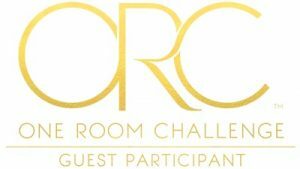 There are so many other fun projects happening on this season’s One Room Challenge, be sure to check them all out HERE. And, you won’t want to miss the 20 featured designers HERE. Wow, that wallpaper is going to be gorgeous. And I can’t wait to see the rail installed. Love the vision! Thank you so much Kylie! Let’s hope it all turns out as planned! 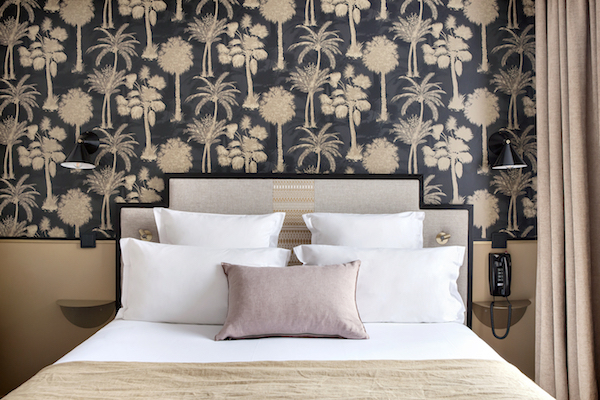 I love the palm trees, so relaxing for a bedroom. You are using lots of striking ideas with it. Love it. Thanks so much, Rose!! I’m hoping it all comes together in time for the big reveal in a few weeks!